Mr. Prasanna Premaratne - Vice President - Trade Services & International Remittances, DFCC Bank, Mr. Anton Arumugam - Vice President- Liabilities and Trade Business Development, DFCC Bank and Mr. Steven Beck – Head of Trade Supply Chain Finance, ADB. 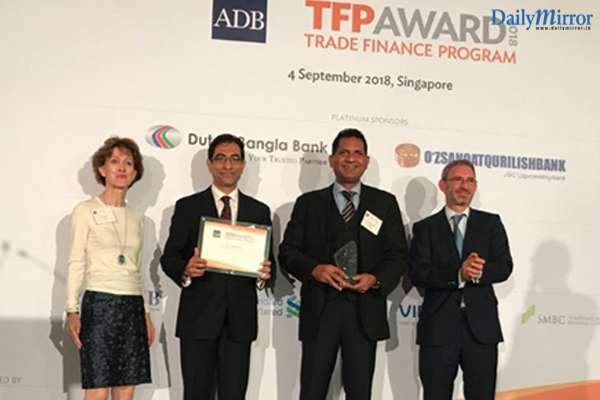 DFCC Bank was bestowed with the ‘Leading Partner Bank in Sri Lanka’ award by the Asian Development Bank (ADB) at its fourth annual Trade Finance Programme (TFP) Awards held on 4th September 2018 in Singapore. Over 200 guests from banks and other financial institutions around the world attended the event. The TFP Awards recognized 23 leading partner banks from 15 countries – with DFCC Bank being the only bank from Sri Lanka awarded at the ceremony. The TFP Awards was held on the first day of the Global Trade Review's annual conference in Singapore, GTR Asia Trade and Treasury Week 2018, one of Asia’s leading trade finance conferences. DFCC Bank’s International Trade Services offer all types of products and services for importers and exporters by facilitating import and export transactions to any bank of their buyers’ or suppliers’ choice, through a global network of over 400 correspondent banks located around the globe. Further details on the Bank’s trade finance services can be obtained by calling (011) 2 350 000.